A portacath (sometimes simply referred to as a 'port') is a small device inserted under the skin on the upper part of the chest. It is implanted for people who need regular infusions of medication over a long period of time, normally as part of immunoglobulin or chemotherapy treatment. This is a quick procedure, generally no longer than an hour, which can be performed under a local anaesthetic. It requires a ~3cm incision to the chest at the insertion point and a 0.5cm incision on the lower neck. 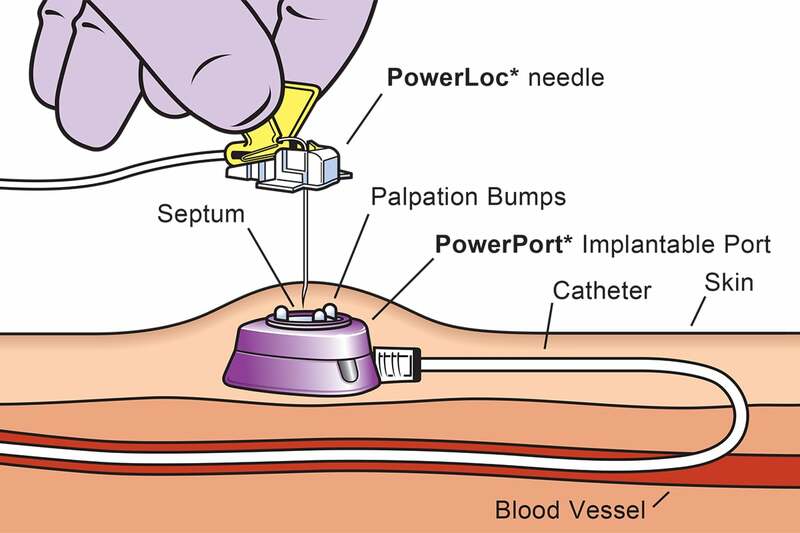 A Portacath in place and an access needle being inserted. © 2017 C.R. Bard Inc. used with permission. Bard, Powerport and PoweLoc are trademarks of C.R. Bard, Inc.
After surgery, you can generally go home after a two-hour observation period and when the anaesthetic has worn off (although as with all anaesthesia you should not drive yourself home). After surgery, you will need to keep the incision dry and clean for 5 days and it is a good idea to avoid strenuous exercise or any strenuous activity involving the arms or chest. If the portacath needs to remain in place for a long period of time, it will need regular (generally monthly) flushing with a saline solution called 'heparinised saline' to ensure the port remains open. Portacath removal is similar and in fact more straightforward than the insertion procedure. It is a quick procedure and is performed under local anaesthetic.